On Ninth: No problem for a guy on a bike to read the titles and borrow a book. 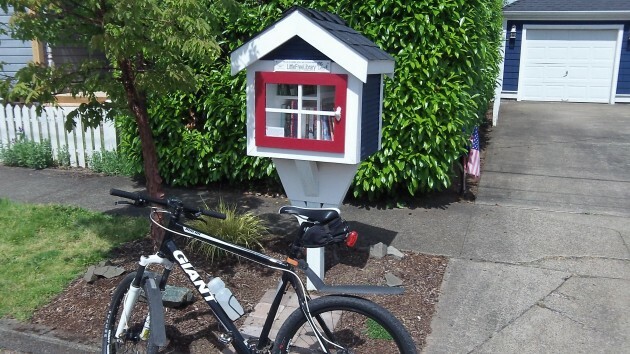 So if I wanted to sample the books in this Little Free Library, I could do so without even getting off the bike. Perfect! And because of the thoughtful placement of pavers, pedestrians could do so too without getting bark dust on their shoes. Looks like great spot, and I’m glad no regulations have gotten in the way. 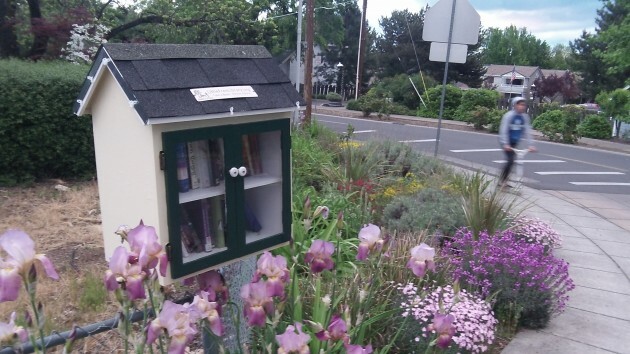 Around Oregon and indeed the world, those little free libraries have been popping up like mushrooms after a warm rain. Scores of these impromptu public book shelves exist in the Willamette Valley alone. They even have a national organization that issues charters (www.littlefreelibraries.org), though no one needs anything official to set one up. It helps to have carpentry skills, though, and of course a small supply of gently used books to make a start. Back on Feb. 14 I ran a story about a little street library on Grandview Drive in North Albany. Last week I came across another one, in the 1100 block of Ninth Avenue S.W. Then I saw an article in The Atlantic. It appeared in February 2015 under the title, “The Danger of Being Neighborly Without a Permit.” It seems that in few places around the country (Shreveport, La., and Los Angeles were mentioned by name), bureaucrats got in the way at least temporarily. They were talking permits and zoning rules, that sort of thing. This one has been operating in Jacksonville, Ore., for some time. Many adults in today’s society don’t relate to the young’uns fixating on electronic widgets. Wonder how many folks in the 15th century couldn’t relate to others fixating on books. Haven’t understood the need for huge backpacks when there’s so little homework. Are the lockers so small that the kids have to take everything with them at the end of the day and drag it back next? ?